As the associated automotive industries grow, the accumulation of waste tires will increase in near future, which will lead to environmental pollution. More than 3 million tons of used tires annually produced only in United States, and up to 2.5 million tons in Europe. The disposal of scrap tires occupies large amounts of valuable landfill space, poses fire and environmental hazards! Naturally, the decomposition of waste rubber exceeds 100 years accompanied by soil poisoning and chemical releasing. This environmental impact could be minimized by viable alternative for the recycling of scrap tires by implementation of waste tire conversion technologies. Today in the waste management world a broad range of technologies are recognized that could be used to divert a portion of waste rubber stream currently being landfilled as well as other hydrocarbon materials. These technologies are classified as follows for physical and chemical. Large amount of scrap tires is used in crumb rubber applications. In term of paving the rubberized asphalt concrete is a viable end use for tires. In term of molded rubber products millions of waste tires are used for crumb rubber products production. Also, as the test results show a crumb rubber is used as an soil additive which increase its permeability as well as airstream. Tire-derived fuel (TDF) can be used in cogeneration facilities or cement kilns, pulp and paper mills or industrial boilers; carbon black can be burned on site for alternative energy recovery or be sold for the needs in various applications. Mechanical recycling is based on tires shredding, cord separation, and next rubber crumb gridding to powder. Disadvantages of this technology are high-energy consumption, rapid wearing of equipment and low quality of final product due to number of contaminating impurity in crumbs. 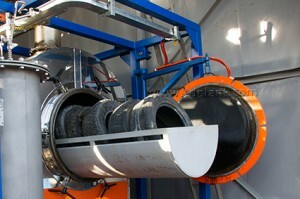 Low-temperature (cryogenic) processing of used tires performs at temperatures from -60 °C to -90 °C, when the rubber is in crack-sensitive state. The benefits presented by this technology are metal and textile separation improvement and the yield of rubber product. Disadvantages of this technology are high cost of coolant (liquid nitrogen), power consumption, and delivery complexity. The waste tires are fed through the holes to the chamber, where under the high pressure are separated on steel cord, textile and crumb rubber. Among the disadvantages of this technology are rapid wearing of the equipment, high energy consumption and multistage crumb rubber system. The technology is based on waste tire oxidation to crumb rubber. During the ozone processing steel and textile cords are completely separated. The high speed facilitates the gridding. Minimal energy involvement. Disadvantages of this technology are expensive equipment, high explosive risk, the highest hazard class of ozone. As a thermal decomposition process, the pyrolysis can be used to convert scrap tires as well as other hydrocarbon materials into useable products such as oil, syngas and carbon black. The technology is based on cracking under the high temperatures and without addition of air or oxygen. As lower the temperature as more pyrolysis oil is produced. As higher the temperature as more syngas is produced. The oil derived from pyrolysis process can be used as low grade fuel in boilers or separated on fractions, such as diesel, gasoline and heavy oil. Pyrolysis gas usually satisfies systems energy needs by heating up the process. Pyrolysis technology is one of the most environmentally friendly, energy and cost efficient solution for treating a wide variety of rubber products in the international waste management stream, implemented in the most developed countries such as the USA, Japan, Germany, Switzerland and others.